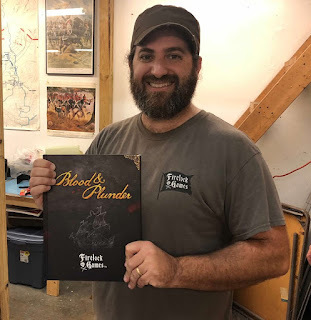 First impressions: Rules Review – Blood & Plunder Pirate skirmish rules by Firelock Games. Check out a quick first impression rules review based on a game Mike From Firelock games ran for my local club "SMG" at our club house in S. FLA, Das Krieg Haus. Good summary. The boys and I have play several of their demo games at the Orlando conventions. I love the game. I think the mechanics for ranged attacks are the best I have seen for this level of skirmish gaming. Mike has a great personality that makes him a very effective advocate for the game. Hi Rick, yeah, it was very cool. As you know from meeting these guys at our HMGS-South cons they are a great bunch. I really enjoyed the rules as well. I'm looking forward to trying out a naval action with these rules. Hope to see you and your boys at Hurricon!